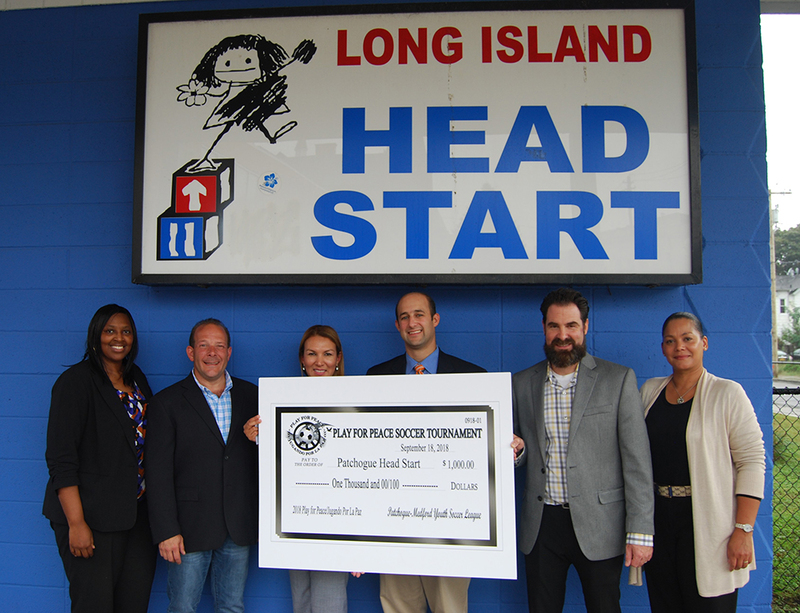 Sponsors from the Annual Play for Peace/Jugando Por La Paz Soccer Tournament present a check for $1,000 to Long Island Head Start in Patchogue. Pictured (left to right): Annette Harris, Director of Program Operations, Long Island Head Start; Jonathan Abrams, Manager, Gershow Recycling; Lina Ortiz, Center Manager, Long Island Head Start; Robert Calarco, Suffolk County Legislator; Christopher Kelly, Vice President of Marketing, TriTec Real Estate Company; and Ana Figueroa, Policy Council and Volunteer Supervisor, Long Island Head Start. On September 18, sponsors of the Annual Play for Peace/Jugando Por La Paz Soccer Tournament visited Long Island Head Start in Patchogue Village to present Center Manager Lina Ortiz with a check in the amount of $1,000. The money comes from funds donated to the tournament from sponsors, including Gershow Recycling, TriTec Real Estate and others. Play for Peace brings together diverse nationalities within the community for a full day of World Cup-style soccer, with a goal of promoting sports as a way for people from various backgrounds to find common ground. The tournament was first organized in 2009 through the office of then-Legislator Jack Eddington in conjunction with the Patchogue-Medford Youth Soccer League. After Legislator Robert Calarco was elected in 2011, he carried on the tradition. Monies raised from the event are donated to local organizations, like Long Island Head Start, which provides a creative curriculum to Patchogue students ages three to five. Head Start plans to use the donation to purchase two projectors for its smartboards. As a comprehensive learning environment respectful of all cultures, Long Island Head Start perfectly exemplifies the spirit of the event.